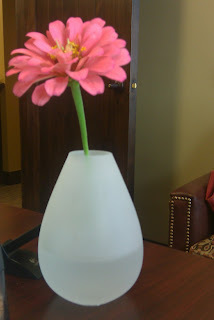 In between chit chatting with my brothers and sisters via email, I catch myself staring at my pretty flower on my desk. (Warning I am about to brag) Yes, this flower did come from my garden. I have no clue why the flower and vase looks enormous, the vase is only about 5 inches in height. Oh, I spoke to P on the phone yesterday after her school. You would never know english was her second language, that girl is adorable!! !